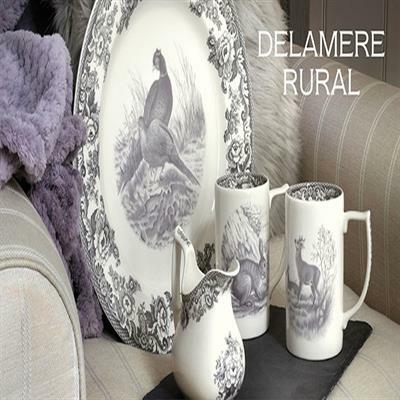 Introduced in 2013, Delamere Rural is an elegant collection based on Spode’s popular Delamere and the striking animal studies of the Woodland pattern. Charming and sophisticated, it encapsulates the British trend for everything heritage and everything countryside. Using the refined Camilla shape, the design features an intertwining border of flowers and scrolls known as “British Flowers” that dates back to the Spode design archives of 1831. In a sophisticated, subtle slate gray colorway, the border is accompanied by a woodland animal on key pieces, adding interest and variety to the range.